You like receiving guests at your house? Welcoming friends and family, either in your living room or basement, at the pool side, on your rooftop terrace or even at the cottage? You enjoy serving them good cocktails but it would be crazy to have a nice bar in each of these locations, right? Or is it? What if you could have one amazing, elegant and spectacular bar that you could easily move from one place to another? 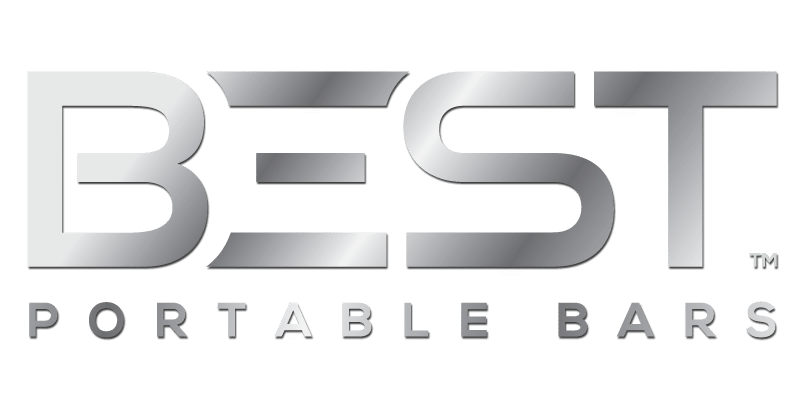 Meet the DELUX Portable Bar by BEST! Its versatility, appearance and functionality are what make DELUX the very best home bar. Its elegant look and beautiful brushed stainless steel finish will first attract attention in the daylight. Then when the time comes to turn on the lights, watch your guests be intrigued and amazed by its spectacular 3d holographic lights effect. Most will think this is a fixed bar you’ve got there since only a fixed bar can look that great, heavy, strong and robust. And yet the DELUX bar can be assembled, disassembled and folded very quickly and easily in less than a minute and without tools! Once in storage mode, the DELUX bar only occupies 30% of its effective space, going from a 46″ x 31″ space when used to 38″ x 11″ when stored. A 70% space saving that can be very valuable if you live in a city apartment or small town house. It is also easy to pass through door frames and small hallways, and will fit in most standard cars. You can therefore easily move it from one room to another, to your balcony, poolside or rooftop terrace. You can even bring it to friends’ place, at the cottage, or why not at work for the Christmas party! Once disassembled into parts, the DELUX portable bar can be carried by one person alone if needed. Although it is strongly advised to team up with someone to move the main structure, it’s so much easier and funnier that way anyways! 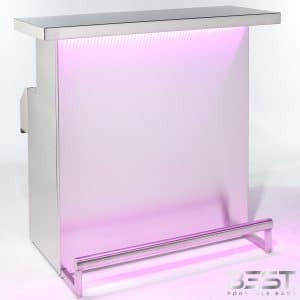 It is also very important to note that BEST did originally design the DELUX portable bar for commercial and professional applications. It is therefore very robust and functional. 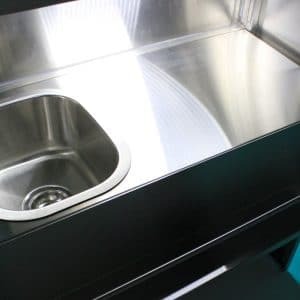 It is entirely made of food rated 304 stainless steel that is also very resistant to rust. This is why you can also use it outdoors, although we recommend covering it when it’s raining. 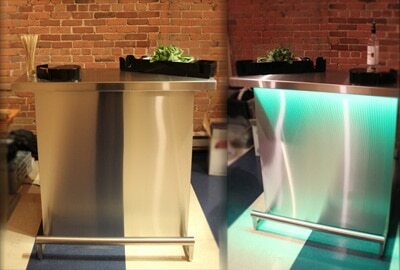 The DELUX mobile bar is hand crafted in Canada using only high-end materials and components. The BEST quality standards are extremely high. Well maintained, the DELUX portable bar will last you years and tens of thousands of cocktails. Those who are environmentally concerned will be pleased to know that the DELUX bar is made with 99% of recyclable materials and packaged with 96% of recyclable materials. Also, its high efficiency LED lighting consumes very little energy. 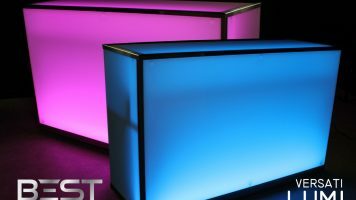 3d holographic lighting is optional and comes with a remote that can control two bars. Dimmable white LED lights are also installed inside the bar to facilitate work in very dark rooms. Other available options are the choice of a plain top shelf, or a top shelf with integrated sink or water free ice bin. Although the sink can be very practical for more permanent setups, we usually recommend the ice bin. Its double layers keep melted water separate from the ice and it can easily be emptied any time during an event. One can also purchase an extra shelf to be installed at the bottom of the bar, useful to keep objects stored underneath the bar dry and without direct contact with the floor. 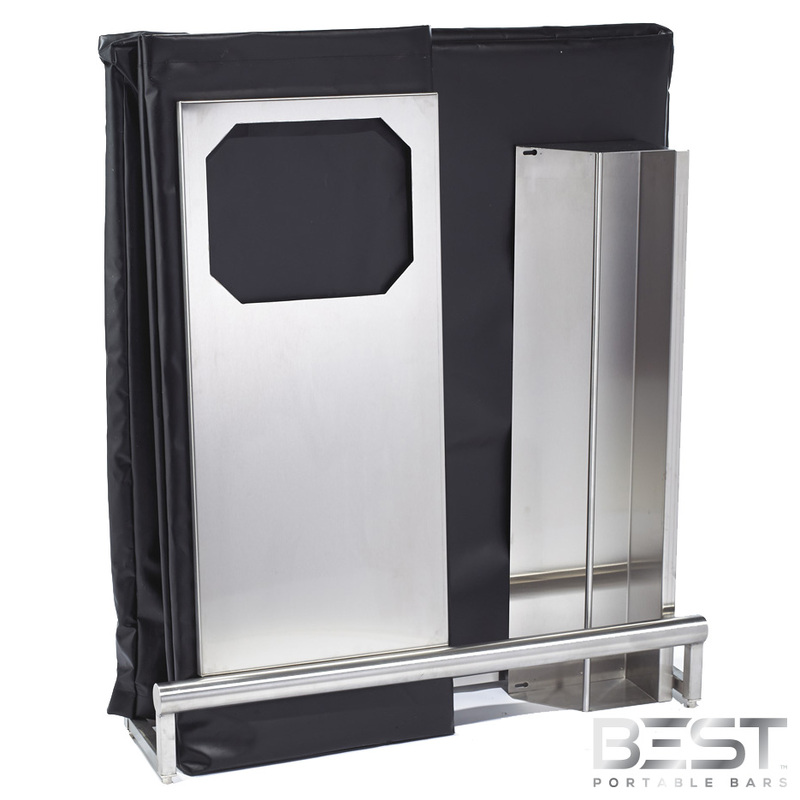 Included with the BEST Portable Bar are two vinyl waterproof bags to protect the bar front and bar top from water and scratches during transportation or storage. 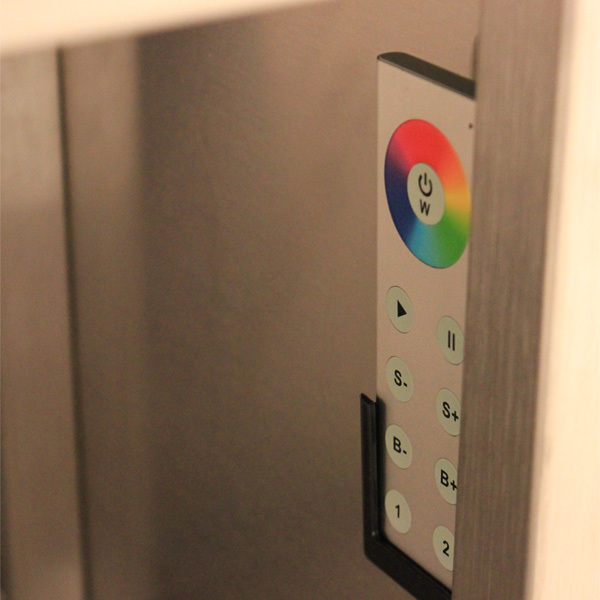 We mentioned earlier that the lights remote could control two bars. The DELUX portable bar has indeed been designed in a way that two or more bars can be joined together to create a long, gapless continuous bar. In order to achieve this, BEST uses a unique three top positions system (left, center and right). To join two bars, set up one bar’s top in the left position and the other bar’s top in the right position. 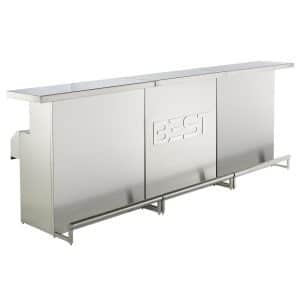 Shorter continuous bar tops are necessary when assembling three or more bars together. The DELUX foldable bar isn’t cheap, but is competitively priced considering its materials and build quality, its elegant and spectacular look and all other benefits. Its excellent price/quality ratio is even more obvious once compared to other competing products. So think twice before buying or building a fixed bar for your home. 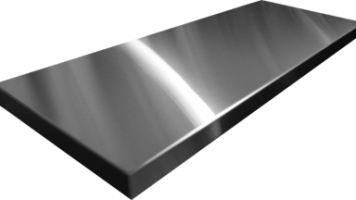 You could get a better looking bar for the same price, one that you could also use in your yard or carry elsewhere. You can get all this in the DELUX Portable Bar by BEST.